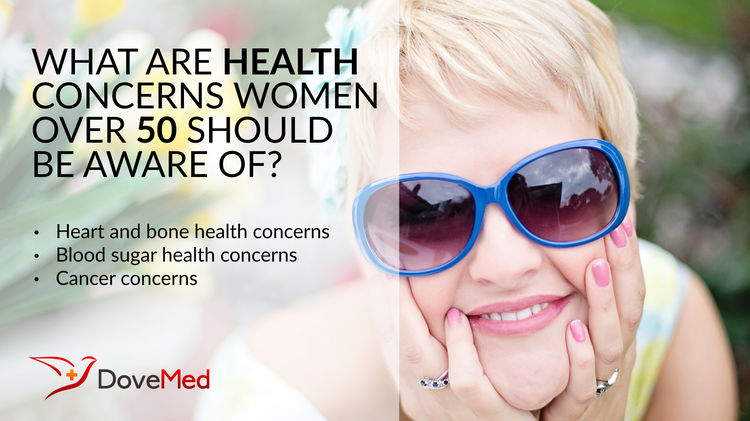 What Are Health Concerns Women Over 50 Should Be Aware Of? For women who turn 50 years of age, health issues become increasingly important and you need to start taking precautions to maintain your health. For women who turn 50 years of age, health issues become increasingly important and you need to start taking precautions to maintain your health. It is important to stay in touch with your body and recognize the signs of potential illness, by knowing the possible health concerns, after you have crossed the 50 year age barrier. By being aware of these potential health threats, you can take the necessary steps to protect yourself both physically and mentally. Blood pressure: Irregular fluctuation in blood pressure can be a common phenomenon after you reach the age of 50. A scientific study conducted by researchers of Texas Heart Institute has shown that after menopause, women above 50 experience an increased risk of heart disease. Researchers have suggested that the decreasing levels of the female hormone estrogen during menopause is directly related to decrease in levels of high-density lipoprotein (HDL or "good cholesterol") and higher levels of low-density lipoprotein (LDL or "bad cholesterol"), thus increasing the risk of heart disease. Cholesterol imbalance: One of the biggest health concerns for women above 50 years of age is increased cholesterol and blood triglyceride levels which put you at increased risk of various heart-related disorders, such as cardiac stroke, hypertension, angina pectoris, and even heart attack. Obesity: Being overweight is a significant factor for many health conditions including cardiovascular diseases, as well as lifestyle diseases such as diabetes and thyroid hormonal issues. Statistics show that if your BMI is above 21, your chances of getting ischemic heart disease increases by 22%. According to a study published in American Journal of Epidemiology in 2005, women above 50 who happen to be overweight or obese are more prone to diseases like heart attack, diabetes, hypertension and atherosclerosis. Osteoporosis: After menopause and after you have reached 50, there is a definite risk of getting bone and joint disorders, like osteoporosis or arthritis. The condition may be especially advanced (may occur earlier), if you are overweight or have a spinal deformity since childhood. According to latest statistics recorded by American Health Guidelines, if you are a woman above 50, your chances of getting diabetes increase by approximately 60%. A recent study published in British Medical Journal in 2014, by Dr. Ana Valadares has proved that with the onset of age, 30% of women above 50 years experienced an imbalance in blood sugar level leading to diabetes. The U.S. Preventative Services Task Force, an expert group that reviews the latest scientific research findings, has suggested that women above 50 years are at a greater risk of getting cancer, especially of the breast, bowel, and uterus. If you are above 50 and you have had a history of cancer in your family, it is recommended that you frequently get mammography screening once every two years for checking developing signs of malignant cells, if any. These are important health checks that one must perform once you cross the barrier of 50 years. Only by knowing the possible health concerns can you keep your body and mind healthy and diagnose any medical conditions early. Weyer, P. J., Cerhan, J. R., Kross, B. C., Hallberg, G. R., Kantamneni, J., Breuer, G., ... & Lynch, C. F. (2001). Municipal drinking water nitrate level and cancer risk in older women: the Iowa Women's Health Study. Epidemiology, 327-338. Lawlor, D. A., Bedford, C., Taylor, M., & Ebrahim, S. (2003). Geographical variation in cardiovascular disease, risk factors, and their control in older women: British Women's Heart and Health Study. Journal of Epidemiology & Community Health, 57(2), 134-140.